I love baba ghanouj. Baba ghanouj…it makes you feel exotic just saying it. I’m lucky enough to live near a great Middle Eastern restaurant called Zaytoon’s that got me hooked on baba ghanouj. I took my brother-in-law (who has been abroad) there and he verified their authenticity. 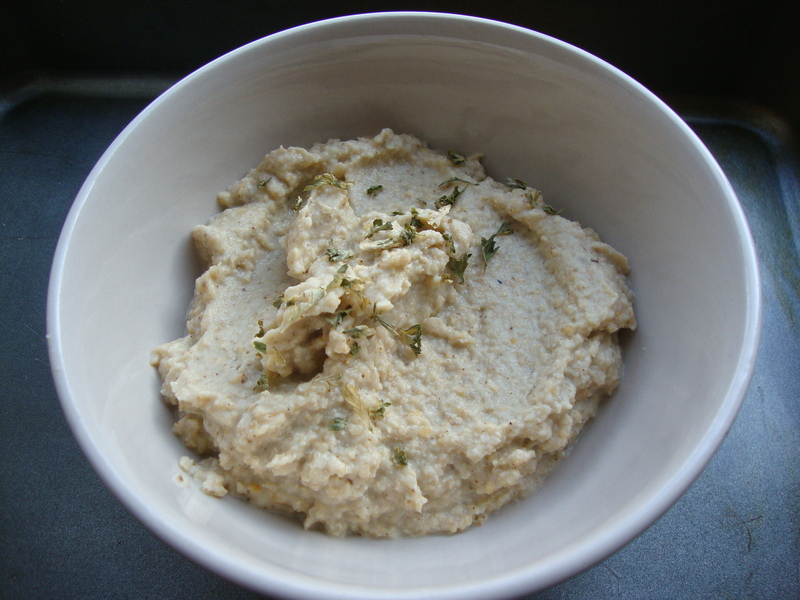 If you’ve never had baba ghanouj it is similar to hummus in consistency and how you eat it. I like hummus, but not as much as I love baba ghanouj. Am I saying baba ghanouj too many times per sentence? I’ll stop. Anyway, I was flipping through a cute cookbook (I have no idea where I got it-It’s definitely used) called Help: My Apartment Has a Dining Room by Kevin and Nancy Mills. It just so happens to have simple recipes with Mom Tips (great idea!) and there was an easy recipe for baba… well you know. Anywho, I was super pumped that I only needed to buy an eggplant, a lemon, and some sesame paste, easy right? Wrong. I could not find sesame paste anywhere! My regular grocery store had sesame oil, which I already had, but no paste. I even asked for help but no one knew what it was. So then I tried the fancier Union Market but they didn’t have it either. By the time I got home I figured I would adapt the recipe somehow using sesame seeds or sesame oil. It worked! Below is Kevin and Nancy’s recipe, but I substituted the sesame paste with my own concoction. Their recipe called for 2 tbsp of paste. I also tweaked some directions. Side note: I tried using my blender at first but for some reason I couldn’t get it to work (human error detected post-experiment) so I switched to the food processor. I would recommend the food processor from the very beginning. -about 1/2 cup of sesame seeds. I eyeballed it. Preheat the oven to 300 degrees to roast your seeds. On a foiled cookie sheet with Pam I sprinkled about 1/2 cup of sesame seeds. I let them bake for about 10 minutes (like you would for pumpkin seeds). They will start to get a little darker. Remove from the oven and Preheat your broiler. 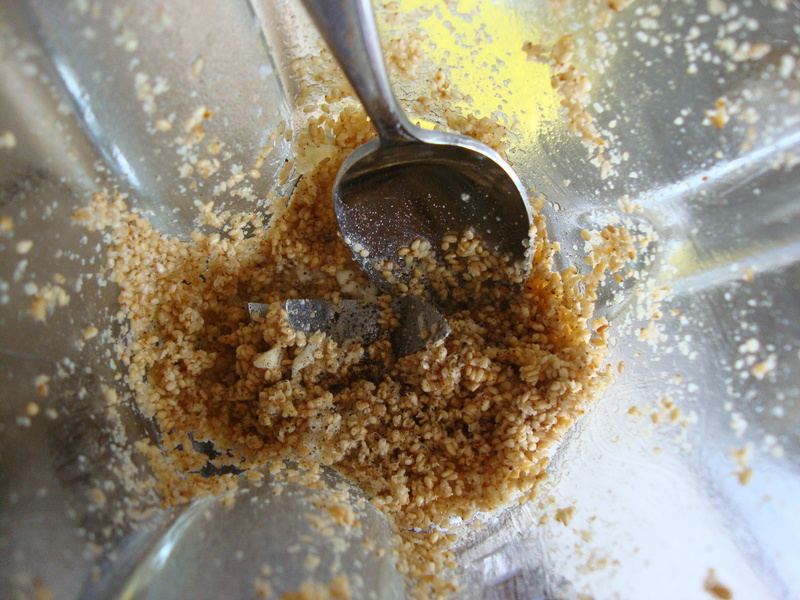 Add the seeds to your food processor with a dash of sesame oil. You will use the same cookie sheet (for all you apartment girls like me without a dishwasher ;)) for your eggplant. Rinse your eggplant and cut off the stem. Then cut the eggplant lengthwise in half. Place the 2 halves cut side down on the foiled cookie sheet. Broil for about 20 minutes. The skin will get wrinkled and ewy, see below. In the meantime, add your lemon juice and pepper to the food processor. Chop up the garlic. In a small bowl mix your salt and garlic together. This is a GREAT tip from Nancy Mills. If you mix the garlic directly with the salt it will spread the garlic flavor more. 1 clove was plenty using this method. Add this to the food processor. Remove the eggplant from the broiler and let it cool for a few minutes. This was hard for me because I wanted to finish this recipe and almost burnt my fingers a few times. Remove the skin (it’s almost like when you take the pulp from a frozen banana for banana bread) and squeeze the pulp to get rid of extra juice. This felt really weird. Add this to the food processor and mix for about a minute, until smooth. Add a little parsley on top if you like. 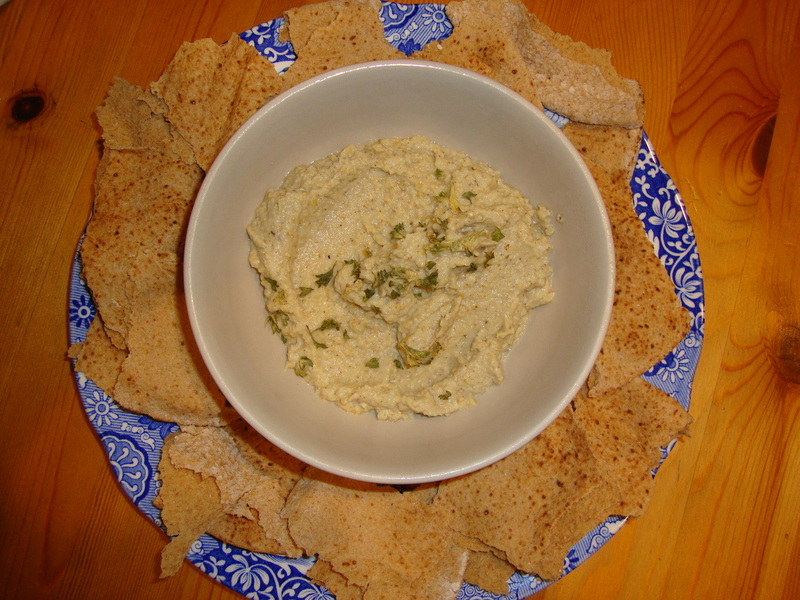 Serve at room temperature with pita bread. It’s so good!